It takes a specific kind of floor to make a home feel enchanting. But the floors that have the most ambiance don’t always go hand in hand with the floors that are the most enduring to a busy life — especially when pets are involved. But within the flooring world, new varieties and elements are often updated where floors can be both durable and beautiful. Below are a few of just those exact types of floors. Often noted for its beauty, solid hardwood sometimes gets flack for being prone to stains and water damage. So it may be surprising to see it on this shortlist of pet-friendly floors. Well, it depends on how hard the hardwood is in these floors. The harder the wood in this flooring, the more scratch resistant it is to pets’ nails. Good woods to use to hold up to rambunctious four-legged friends include oak, cherry, maple, hickory, and mahogany, among others. The Janka Hardness Scale is what determines the level of hardness or softness in wood flooring. Any rating less than 850 is considered softwood. Anything with a rating of 1250 and above is considered solid hardwood. 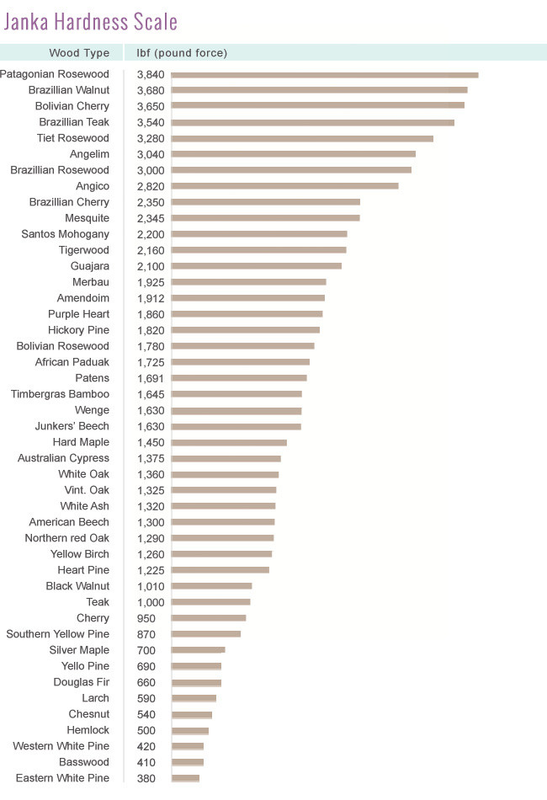 You can see the rating of various woods on the Janka Hardness Scale below. Another added benefit of solid hardwood? It’s easy to dry mop and vacuum. An all-powerful flooring choice, of course luxury vinyl plank (or LVP) makes the shortlist of pet-friendly floors! When compared to several other flooring materials, luxury vinyl tile is one of the most cost-conscious floors available. But its price isn’t the only reason it’s a good flooring choice for pets. Scratch resistant, stain resistant, abrasion/dent resistant, water resistant — need we go on about why LVP is a superb choice for pet-friendly floors? While these floors are the utmost enduring, they also are designed to last — so even if you and your pets end up moving, when another family that has pets moves in, luxury vinyl tile will last well into another family’s lifetime. Easy to maintain (LVP simply needs be swept and occasionally wet mopped), LVP is low in allergens (good for a dog or cat that frequently sheds) and new varieties can even be treated to be antimicrobial. Though having a resemblance to solid hardwood floors, the appearance of laminate is where the similarities between these two floorings end. Depending on the brand of laminate flooring you purchase, it can be an extremely durable floor, but some high-gloss options can be slippery, causing any four-legged furry pets to slip and slide. But, if you purchase brands of laminate that are designed to endure life (Does the Timeless Designs laminate collection ring any bells? ), then a laminate floor is extremely pet friendly. How so? Well, built with a special protective layer that is oftentimes called the “wear layer,” laminate is resistant against abrasions, stains, scuffs, and various spills. Plus, with its protective layer, laminate is much easier to clean up than its solid hardwood counterpart. While scratches from pets’ nails can occur, they are visibly less noticeable on laminate than other solid floor choices. To browse all of the durable, yet enchanting, pet-friendly flooring options Timeless Designs Flooring offers, see our solid hardwood collection, our luxury vinyl click collection, and our laminate collection.